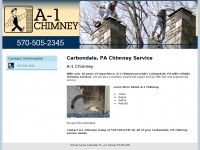 A-1 Chimney provides reliable chimney services to Carbondale, PA. Call 570-505-2345 for a free estimate. The websites author and copyright owner is Chimney Service Carbondale, PA - A-1 Chimney 570-505-2345. The web server used by A-1chimney.net is run by hibu and located in USA. There are many websites run by this web server. The operator uses this server for many hosting clients. In total there are at least 347 websites on this server. The language of these websites is mostly english. The webpages of A-1chimney.net were developed using the programming language JSP/JAVA. The markup language of the website is XHTML 1.0 Transitional. Both the inclusion of the website in search engines and follwoing of its hyperlinks is explicitly allowed.